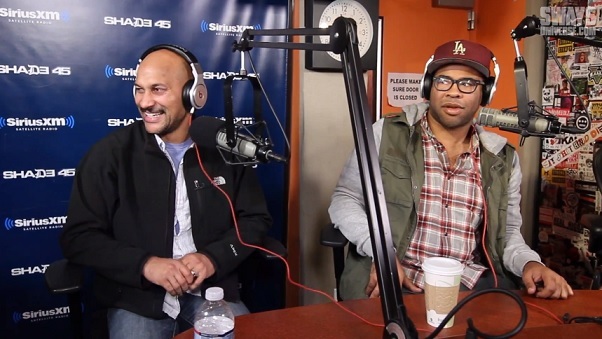 Here’s some footage of Comedy Central’s Key and Peele on Shade 45 as they stopped by for an exclusive interview on Sway In The Morning. Calloway made sure that the hilarious comedians knew he was a fan of the show as they kicked things of by sharing their thoughts on marriage and announced they’ve signed on for a fourth season. Key & Peele also addressed their infamous Barack Obama “Luther” comedy sketch and share a story of actually meeting the President. In fact, the duo explained that Obama was well aware of their sketch and revealed he’s a fan of their work. This entry was posted in In The Studio, Miscallenous, Video and tagged comedy central, hip hop, key peele, radio, rap, Sway Calloway, sway in the morning. Bookmark the permalink.